is the first time such a verdict has been arrived at in an Irish coroners court. In case you missed this story here is the link to it on the Irish Times. Gardaí have issued an appeal for information on a fatal road incident in Co Wicklow. A 41-year-old man died after he was knocked down at Coyne’s Cross in Ashford at around 1.30am. A 21-year-old man was later arrested under road traffic legislation and brought to Gorey Garda Station but was subsequently released. Gardaí have asked for anyone who was on the N11, travelling south between 12.30am and 1.45am, to contact them. They say they want to speak to people who may have seen the man walking, or who witnessed the collision. The N11 has now reopened southbound between the Newtownmountkennedy and Rathnew exits following the incident. All diversions have been lifted, but motorists are warned that conditions remain icy in the area. Friends…. I’m not sure if everyone is aware but my sister Blathnaid has been missing in Dublin since Tuesday December 14th. We now know that Blath was wearing the following clothes; 3/4 length black woolen jacket, red and black scarf, grey jeans and dark shoes\boots. She was last seen getting into a taxi on Sir John Rogerson’s Quay at 8pm on Tuesday December 14th. Please share this link along with the photo with all your friends particularly people living in the Dublin metropolitan area. Anyone with information is asked to contact Harcourt Terrace Garda Station on 01-6669500. The Government has injected a further €525 million into EBS Building Society, it was confirmed today. The new funding comes through special investment shares issued to Minister for Finance Brian Lenihan. The shares give Mr Lenihan control of the building society, including the composition of theboard and passing of members’ resolutions. The latest funding means EBS will meet the core tier 1 capital ratio of 8 per cent by December 31st. The institution was told by the Central Bank in March to raise €875 million by the end of December. However, in November it told the building society it needed to increase its capital ratio to 13.5 per cent by the end of the year, meaning it needs to find an additional €438 million. The Central Bank today said it has since extended that deadline to the end of February. Other lenders had been given until at least the end of February to achieve new targets, set on November 28th. EBS, which the government is currently looking to sell, has already received €100 million in funding from the State in the form of a promissory note, and a €250 million injection through the issuance of special investment shares. Irish Life & Permanent and Dublin-based private equity group Cardinal Asset Management are currently bidding to buy EBS. FInal bids are expected to be in next week. New legislation coming before the Dáil today will give the Minister for Finance new powers that would allow the Government to inject further funds required if the EBS is not sold. The Irish Times (above) reports this morning that the State has injected a further €525m into EBS. This is in addition to the €100m in cash injected in the building society in May 2010 and the €250m injected via a promissory note in June 2010 (Ciara O’Brien gets the two mixed up in her Irish Times article). What this means is that the €875m that was flagged as the additional capital requirement in the Financial Regulator’s PCAR in March 2010 has now 100% been provided by the State whereas previously there had been a suggestion that a third party, perhaps one of the two remaining bidders for EBS (Irish Life and Permanent and the Cardinal Consortium) might stump up some of the requirement. The €875m was provided as follows (a) €100m in cash in May 2010 (b) €250m in promissory notes in June 2010 and (c) €525m in cash in December 2010. The PLAR published by the Financial Regulator on 28th November, 2010 signalled that EBS would need raise a further €438m by 28th February 2011 (that’s on top of the €875m) and the betting would be that the State will need pony up that also. And where did the €525m just now injected in EBS come from? That would seem to be from either the NTMA cash balance (the “fully funded until the middle of next year” money) or from the NPRF (whose €17bn unencumbered funds might have been made available for running the State but instead are being shoveled into the banks). The €875m that has been shoveled into EBS so far (and the additional €438m that will be burned there by the end of February 2011 – shoveling and burning imply some sort of constructive locomotion but alas it’s merely loco as the money is unlikely to be even partially recovered) are as nothing though compared with Allied Irish Banks (AIB) which will require a further c€3.7bn in the next two weeks to meet the PCAR (Sept 2010 version) and will need an additional c€2.5bn by the end of February 2011 to bring the overall State investment in AIB to €12.745bn approx (€3.78bn already invested in preference shares and share acquisition costs, €3.7bn in the next two weeks and €5.265bn by the end of February 2011 and that’s on top of €3.4bn generated by AIB through disposing of its Polish Bank Zachodni and US M&T stakes). The €3.7bn in the next two weeks is also likely to come from the NTMA strategic reserve or the NPRF. I think it is noteworthy that EBS has been provided with its 31st December 2010 PCAR requirement two weeks early whereas AIB which is in the wars with its bonus controversy will seemingly wait until the fuss has died down before it is gifted its €3.7bn. Bank of Ireland appears to be okay for the next two weeks though my strong view is that NAMA’s absorption of the sub €20m exposures will create a further, thus-far undeclared, hole in BoI’s capital. NAMA, BoI, the Financial Regulator and the Department of Finance seem to be working on the basis that the remaining tranche for BoI would attract a 42% (40% in one ministerial statement) haircut. 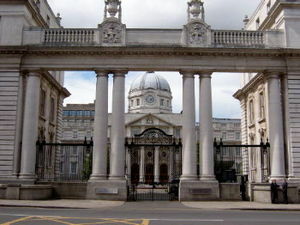 Confidential messages received here indicate that there will be some horror stories that will be uncovered by NAMA and that there is no genuine reason for BoI’s smaller exposures to have a lesser haircut than AIB’s (which according to the September 2010 estimates, the latest available, is to be 60%). Irish Life also appears okay for the time being and has exceptionally been given until May 2010 to find €243m of capital and the betting is that it can do this without recourse to the State. And that leaves the two lead-zombies in our financial landscape – Anglo and Irish Nationwide Building Society (INBS). The bailout cost for INBS went from €2.7bn in April 2010 to €3.2bn in August 2010 to €5.4bn in September 2010. The €5.4bn is on the basis that NAMA applies a 70% discount to INBS’s last tranche and that there are no additional unprovisioned losses on the remaining €2.6bn of non-NAMA loans (the last recorded provision on these was €0.2bn). You would hope that at this stage there is limited further downside with INBS but (a) their non-NAMA loan provisions look low and (b) as with the other banks there is concern over undiscovered losses with derivatives. And so to the chief-zombie, Anglo. My understanding is that NAMA has transferred practically all of Anglo’s NAMA loans though NAMA has not issued a statement on the matter (it found the time to issue a lengthy reply to the CIF-comissioned hatchet job on the agency but not the time to report on a transfer that was flagged as urgent at the end of September 2010). Paddy McKillen’s estimated €900m of lending is still with Anglo pending the outcome of the appeal which is starts today in Dublin’s Supreme Court, but my understanding is practically everything else has been absorbed. So is NAMA able to confirm the final (estimated, pending full due diligence by the end of March 2011) discount? Is it 67% (I understand it is) or as high as the worst case scenario of 70%? And how is Anglo getting on with its €38bn of non-NAMA loans? Has the outlook improved on these (mostly commercial property non-land and development, half located in Ireland and one third in the UK and remainder in the US) loans? And remember that Anglo and INBS have thus far been mostly funded with promissory notes (IOUs signed by the Minister for Finance and deemed good enough for Core Tier 1 capital by our Financial Regulator). These IOUs need to be converted to real money and a long-held concern on here was that there would be frontloading of the conversion to cash, not a convenient 1/10th per annum for the next 10 years. So what will the shoveling profile be for the promissory notes? The great concern with the present shoveling is that it is depleting real money from the NTMA (the “fully funded to the middle of next year” reserve) and the NPRF. And should the actual cost of rescuing the banks increase and we need an additional bailout, we may find that we have sacrificed our strategic reserves and will be left effectively seeking funding from a “beggars can’t be choosers” position or a messy default. What can I say that I haven’t already said! How Cowen and lenihan are still in place boggles the mind and I must conclude that the people around them are as guilty as they are! Retribution can’t come soon enough for them! Time to build a guillotine? Ireland entered the Twilight Zone yesterday – tipped into another dimension by a gaffe-prone Government’s cheesy attempt to butter up the electorate. Do not be alarmed, for there is Philadelphia light at the end of the tunnel. Jaws hit the floor at breakfast time when the Minister for Agriculture proudly informed Morning Ireland listeners of the great news. “Free cheese for the needy,” trumpeted Grand Fromage Brendan Smith, having spent the previous few minutes side-stepping questions about the publication of the dreaded austerity plan. A budget from hell may be on the way, with €6 billion in cuts and tax rises planned for next month. We are living beyond our means, cautions the Minister for Finance, reprising Charlie Haughey. The future looks grim. But at least we have cheese. Cavan’s answer to Marie Antoinette sounded very pleased with himself. Have they no sense? Did nobody think that boasting about handing out a bit of free cheese – laudable as the scheme is – might seem a little crass when set against the financial tsunami on the way? Did the Cabinet sit in silence, bereft of ideas, at their meeting in Farmleigh and wonder what they might possibly come up with to comfort a worried nation? Then somebody shouts: “Jesus . . . cheesus . . . cheeses . . . cheese . . . that’s it. Cheese! Let them eat cheese!” And so the low-profile Brendan Smith gets his big moment on Morning Ireland and launches into one of the most absurd radio performances since Joe Jacob’s memorable interview on what to do in the event of a nuclear accident. The free cheese scheme has been running for well over a decade, but no minister ever felt the need to make a big deal about it until yesterday. By mid-morning, Brendan’s announcement had made it to the international cheesewires. The Opposition rushed to condemn what they saw as the Minister’s insensitivity. Stung by the avalanche of derision, Mr Smith fought back, saying Fine Gael’s reaction to his free cheese announcement was “deeply offensive, especially to the many charity organisations which rely on it each year”. If there were free wine on offer, which there isn’t, John Wilson, Irish Times wine expert, recommends “a nice Chateauneuf du Pape to go with your Coalition cheddar. It would be funny, if things weren’t so damn serious. we all know what happened to Marie Antoinette and things are now getting to a state I might just start to build my own guillotine and I know who will be first in line to get the chop! We disagree strongly. We see nationalisation as being the inevitable consequence of a required recapitalisation of the banks done on terms that are fair for the taxpayer. We can summarise our arguments in favour of nationalisation, and against the Government’s current approach of limited recapitalisation and the introduction of an asset management agency, under four headings. We consider that nationalisation will better protect taxpayers’ interests, produce a more efficient and longer lasting solution to our banking problems, be more transparent in relation to pricing of distressed assets, and be far more likely to produce a banking system free from the toxic reputation that our current financial institutions have deservedly earned. Our banks have made an enormous quantity of bad loans, mainly to property developers, and realisation of these losses will see a substantial erosion of their capital base. International financial regulations require that banks maintain certain levels of capital to be allowed to stay in business. In addition, as the recession mounts, so too will bad debts in consumer and other commercial loans, and so our banks need outside capital investment to make up the losses on these loans. The highest grade, and most desirable, form of capital is ordinary share capital, and in the current circumstances the Irish Government is the only conceivable investor willing to provide this capital. The Government has put forward Nama as a vehicle to take these bad loans off the banks at a discounted rate. To the extent that the realisation of losses on these loans erodes the capital position of the banks, the Government has indicated that it is willing to supply equity capital in return for shares. Crucially, however, the Government’s current descriptions of the range of outcomes from this process suggest that they are badly underestimating the scale of losses at our banks, and as such may end up substantially overpaying for bad assets. Take our two leading banks, AIB and Bank of Ireland. Analysts have repeatedly estimated the extent of bad loans at these banks to be of the order of at least €20 billion. Losses of this sort would wipe out virtually the entire €27 billion of Tier 1 capital of these banks. This means that if the Government purchases these loans at fair market value, it will end up having to provide funds to replenish fully the equity capital of these banks and, in consequence, would end up with essentially full ownership of these banks. There is thus a fundamental internal contradiction in the Government’s current position. The Government is claiming that it can simultaneously: (a) purchase the bad loans at a discount reflecting their true market value; (b) keep the banks well or adequately capitalised; and (c) keep them out of State ownership. These three outcomes are simply mutually incompatible, and we are greatly concerned that the Nama process may operate to maintain the appearance that all three objectives have been achieved by failing to meet the first requirement. This would arise if Nama purchases the bad loans at a discount – but still well above market value. With €90 billion in loans to be purchased, the consequences to the taxpayer of overpaying for bad assets by 10 to 30 per cent are truly appalling. To put these figures in perspective, the effect in a full year of the Budget measures taken last week was to save the exchequer €5 billion. Peter Bacon and others have argued in recent days that the question of who owns the banks does not matter, because the ownership structure does not change the underlying size of loan losses. Frankly, this is argumentation by distraction. Nobody is claiming that nationalisation changes the underlying loan losses on the bank balance sheets. However, what it does change is who owns the equity and also who has first claim on any increase in value in the new banks after they have been recapitalised. If nationalised, the taxpayer stands to get a return on their equity investment after the banks have been sold into private hands in a few years’ time, and this would substantially reduce the underlying cost to the taxpayer. Furthermore, nationalisation offers an opportunity, should the Government see such a need, to share directly with the taxpayers the upside in restoring banking sector health. Such an opportunity could involve a voucher-style reprivatisation of the banks and could be used to provide economic stimulus at a time of scarce resources, at no new cost to the exchequer. With the Nama process charged with meeting the three mutually contradictory objectives above, it is also possible that objective (b), recapitalising, will not be fully met. In other words, a Government that needs to be seen to purchase the bad assets at a reasonable discount and that does not want to take too high an ownership share may end up skimping on the size of the recapitalisation programme. Thus, rather than create fully healthy banks capable of functioning without help from the State, this process may continue to leave us with zombie banks that still require the State-sponsored life-support machine that is the liability guarantee. However, once nationalised and with the promise of future returns for the State, the incentive for the Government will be to create well-capitalised healthy banks that can be privatised and allowed to operate independently from the State, as quickly as possible. We believe that full nationalisation now will end up getting the State out of its involvement in the banking business faster than the current approach being taken by the Government. In contrast, a circumstance where a drip-feed of recapitalisations is required would be the worst of all possible outcomes. Peter Bacon and Government Ministers have stressed that it is necessary to keep the banks out of public hands so that the process is a transparent one. Every additional euro that the State pays for bad assets is an additional euro for the current bank capital holders and one euro less of valuable equity investment for the State. For this reason, the process by which Nama purchases the bad assets is going to be an extremely controversial one. Already, analysts are citing ranges from 15 per cent to 50 per cent as appropriate for the discount on these loans. However the Government decides to price these assets, whether it be via accountancy firms, auctioneers or economic consultants, the process is going to have an element of arbitrariness to it and is unlikely to be one that will be widely seen as fair and transparent. By contrast, nationalisation per se requires no such controversial asset-pricing process. Nationalisation can still involve a Nama, if the Government believes that reprivatisation of the banks would proceed best if certain of the most toxic and compromised assets have to be taken off the bank books altogether rather than just written down to market price. However, the valuation process in this case would cease to be controversial, as the Government would own both the Nama and the banks, so the price would hardly matter. The Swedish bad bank experience (widely mis-reported in this country) involved an asset valuation board that set the price for assets transferred from nationalised banks, but the process was not a controversial one. A related argument that Government officials have made against nationalisation is that it would remove the stock market listing and market monitoring function, rendering opaque the quality of the State-owned banks. However, the experience of recent years is one that would have to cast doubt on the ability of markets to effectively monitor financial institutions. The Government’s plans seem likely to keep in place the current management at our biggest banks. This type of incremental change will do little to restore the battered reputation of Irish banking. It would be difficult to avoid claims of crony capitalism and golden circles were billions of State monies to be placed into the banks with minimal changes in their governance structure. Nationalisation provides the opportunity for a fresh start for Irish banking. The State should run the temporarily nationalised banks as independent semi-State operations headed by highly independent boards of senior figures of the utmost integrity. Executives for these banks should be sourced through an international search, and remunerated accordingly. These executive boards should be charged with a clear mandate to improve risk management practices, restore the brand image of Irish banking and finance, and return the banks to private ownership in a reasonably short time frame, for as high a stock price as possible. This would certainly see substantial changes in senior management and board members in these banks, and allow for a rebuilding of the reputational capital of these institutions. To conclude, we consider that the Government’s approach of limited recapitalisation supplemented by Nama represents only a partial solution to our banking problems, and one that is unlikely to protect the taxpayer. A nationalised banking system with a mandate to restructure and reprivatise would be a preferable approach at this time. 18 months later we see these people were right all along! there is no market so there is no value ! Last Friday in the irish Times I picked up this article and it appears we are taking on another 200 billion in Bank debts? ?Doc132010 (last paragraph) are these the derivate losses I am talking about? The banks are continuing to hide these huge losses and the government is colluding with the banks with this fraud! We need a general election.